While in port at Ketchikan, explore the wilderness on this 3.5-hour rain-forest canoe-and-nature-walk shore excursion, suitable for all fitness levels. 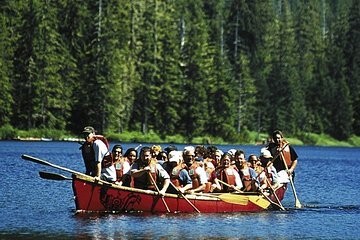 Along with your group, paddle a large Native American–style canoe across a tranquil lake in the Tongass National Forest, and gain insight into Ketchikan's Native American history. Learn about the forest's wildlife and lush vegetation on a short walk through the woods. Leave behind the modern luxuries for a peaceful experience in nature. Enjoy a guided nature walk through the rain forest - suitable for all fitness levels! After port pickup, your 3.5-hour Alaskan shore excursion begins with a picturesque coach ride to a quiet mountain lake. Here, board a stable, easy-to-maneuver, Native American–style canoe large enough to accommodate your group. Navigate across a lake through the Tongass National Forest, the largest national forest in the United States. Hear about the Native American history of the Ketchikan area, and keep your eyes peeled for wildlife along the shoreline. Dock the canoe, and dig into delicious Native American–style snacks, including clam chowder, smoked fish, fresh bread rolls with wild berry jams, and refreshing beverages. Revitalized, set off after your guide on a short nature walk through the rain forest. Then, paddle back to the departing dock and enjoy transport back to the cruise ship port. The trip was fun, but the booking done through Viator was for the wrong timing, so I had to coordinate for the correct timing. Had a great Tour Guide, very nice and funny (a big plus!). Everyone paddles, which is great exercise. Didn't really go anywhere, just paddled around a big lake. Saw one Bald Eagle, but no other wildlife, a big disappointment! Nature walk was about 15 minutes looking at plants... pretty boring really! They supplied some yummy snacks, had a fun time, but leaving Alaska feeling like we really saw nothing we don't see at home (WA State). A great trip. Our guides were extremely knowledgeable, telling us stories about many of the different plants within the forest. The canoe trip was nice as well. The snack provided was amazing, homemade stuff that was both local and delicious. Perhaps the only thing I might desire is a longer walk through the forest.